On Monday I picked up Uhaul 6x12 trailer and had a friend help me get the last, and also large, items out of the house. 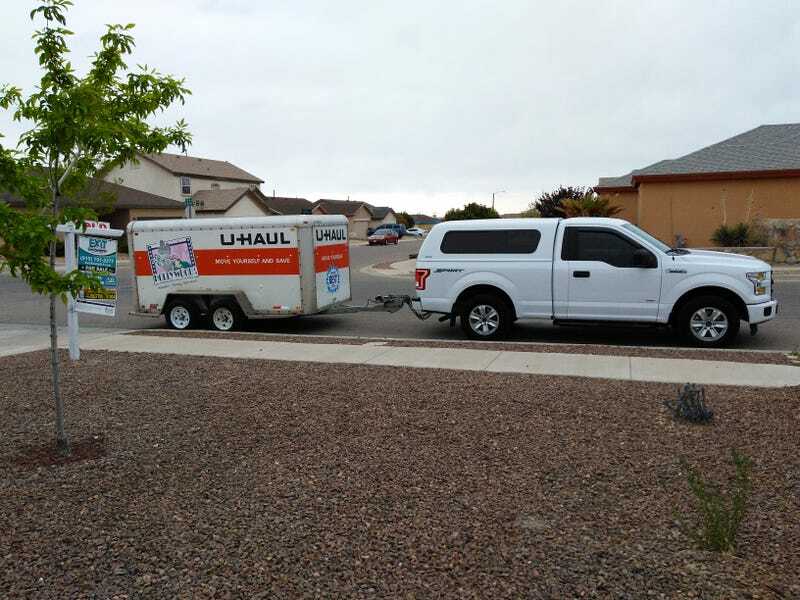 I had planned to use a 6x12 open Uhaul trailer with a ramp to wheel appliances up onto via two wheeler, but Monday turned out to be cool, cloudy and splitting occasional rain all day. That kind of weather never happens in Southern NM in the sprig, and I wasn’t really wanting to mess around with tarping a sofa and mattresses. I lucked out and the Uhaul place had an enclosed 6x12 trailer available. These go by the dsignation RV in uhaul speak. Unlike the last on of those I rented, this one towed nice and straight and got the job done. Filled with stuff, the 2.7 ecoboost F-150 returned about 19mpg with the cruise set at 80mph and a crosswind. With everything out, I cleaned the place Monday afternoon and camped in the house that night via sleeping bag. The rest of the week has been staying at a hotel in Las Cruces, with closing in the new place today. So far being technically homeless has been fun with more golfing and beer drinking than usual, as I took the whole week off work. That fun should turn into a lots of lifting and large uhaul truck tomorrow.